i have so many projects to share with you, i’m just going to throw three into one post. 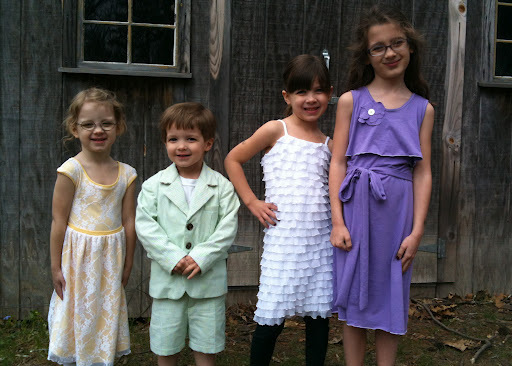 for easter (yes, i’m still posting my easter projects…) i made my three girls some knit dresses. i was in a time crunch and needed dresses that didn’t require more than a day to complete. also, my apologies for the less than stellar pictures. i took these on easter and it was oh, 40 degrees out. they’re trying their hardest to hold back the shivers for the five minutes it took to get these pictures. yes, i meant to get better pictures later but i just haven’t, okay? okay. my oldest daughter, anastasia, loves the color purple. she’s not much into the frilly outfits, but she still loves wearing dresses. 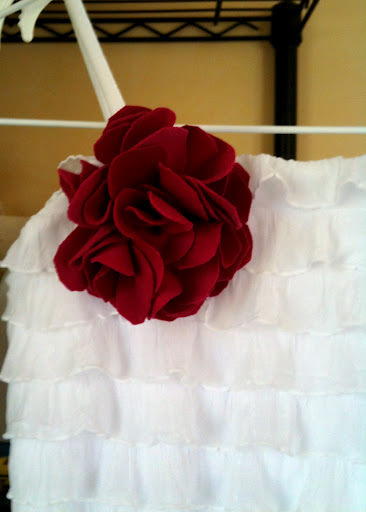 so i designed a simple tank dress with a long ruffle attached at the neckline. i love this because it is a little feminine detail without all the frill. i added waist ties in the side seams that she can wrap around. 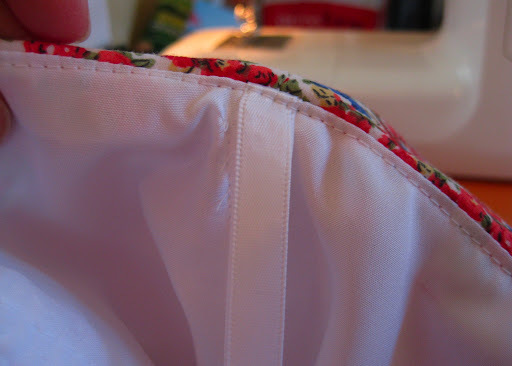 to finish the hem of the ruffle and bottom of the dress, i simply used a 3 thread rolled hem on my serger. can’t get much easier than that! 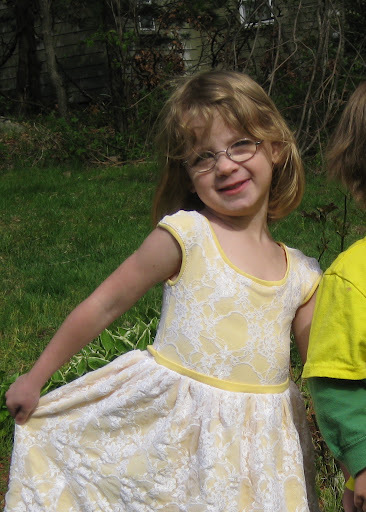 daughter number two, sylvia, is the exact opposite of her older sister. for her there can never be a sufficient amount of ruffles! 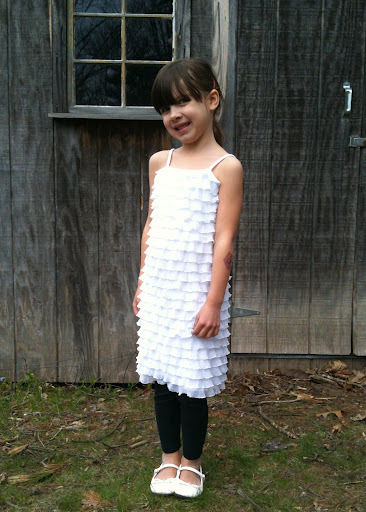 to make this easy on me, i just bought ruffle material and made a simple shift dress. from measuring, to cutting, to sewing to wearing this took maybe an hour and a half. i lined the dress with white knit, otherwise it would have been a little see through. i also made her this adorable pink knit flower pin based on this tutorial (which she lost after having it for all of 15 minutes and was not seen again for almost a week…) to give her outfit a little color. and lastly is isabella. 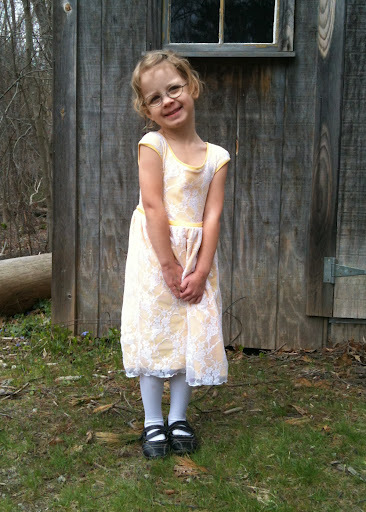 my dear, sweet isabella was looking for a replacement for a “princess dress” which has been worn to death. 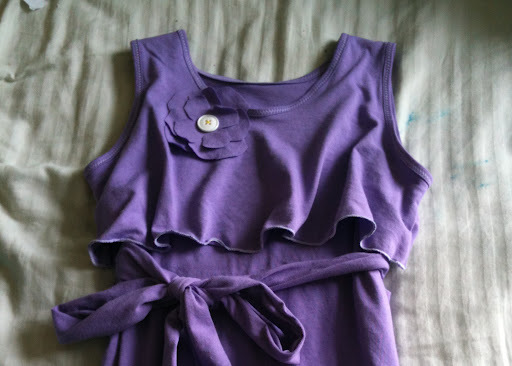 it was purple, stretchy and lacy and originally belonged to my littlest sister, but found a second life and was adored by each of my little girls. to create something similar, i layered stretchy lace on top of a yellow poly knit and constructed it on the serger. i finished the edges with a flat piping kind of thing out of the yellow knit. the whole dress was super easy and i love the result! and most importantly, the princess agrees. i’ll save my son’s outfit for a separate post. for whatever i skimped on the girls’ outfits i poured into his! yup, that’s a seersucker suit. good heavens, could that boy be any more adorable? long ago in a faraway land i mentioned about how i was making my sister’s wedding dress and i believe i promised some posts relating to such… so finally i’m delivering on that. i’m about a week away from finishing it up (yay!!!) so i figured now is as good a time as any for a sneak peek. now, i am by no means an authority on such things as making wedding dresses. i might be doing everything wrong. in my defense, i have studied couture bridal books (such as susan khalje’s) and gleaned the best blogs for every technique that seemed useful. 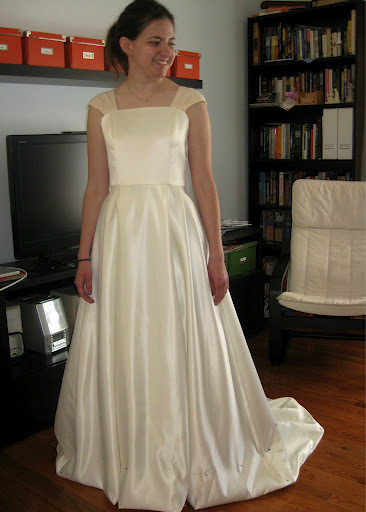 the dress is fairly simple in design with clean lines in a classic shape. 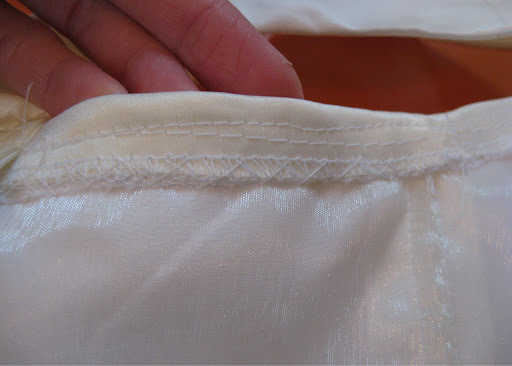 this means that every seam must be perfect because there’s no hiding the mistakes. in a gown such as this, the name of the game is structure, structure and more structure! it’s a bit tricky to balance the number of layers involved without having enormously bulky seams. 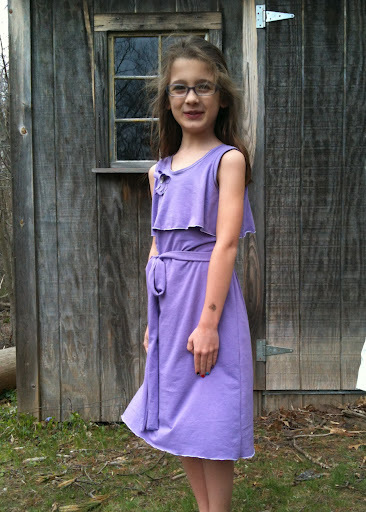 the shell fabric is a duchess satin, which i underlined with a medium weight sew-in interfacing. the interfacing is rather thick, so to keep the seam bulk down i cut off the seam allowances and zig zagged over the edges onto taffeta, which is significantly thinner. each bodice piece ends up looking kind of like a giant band-aid. how glamourous is that? then i stitched the shell to the underlining band-aid pieces and sewed it up. i left a huge seam allowance at the back seam, just to check for fitting and such. onto the skirt… i spent forever trying to figure out how to draft the skirt in order to add on a train. it’s not just a matter of adding length at the back (or so i found out). it took me forever to get this part right, but finally i ended up with something that looks like a wedding train. i was very close to giving up and buying a pattern, but i’m glad i held out. 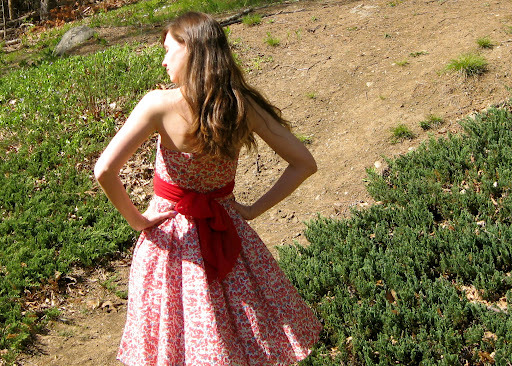 instead of a gathered pouffy skirt, we went with four tucks in the front and four in the back. notice how the tucks and bodice seams line up? not an accident. i also drew on the skirt tucks in creating the cap sleeve-ish straps, also lining up a tuck with the bodice seams. lovely, is it not? for the boning, i decided to make boning channels by sandwiching some lining material with organza and stitching through the two. 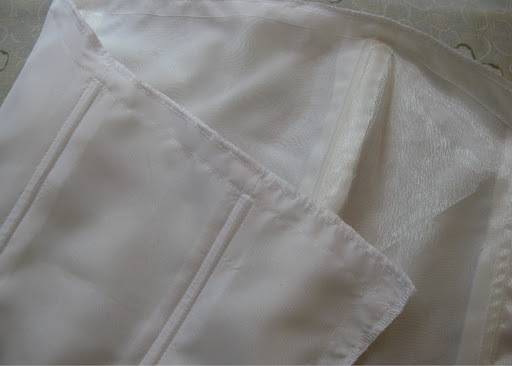 this is much more sleek than using sewn on boning channels plus the organza provides an extra layer of support. 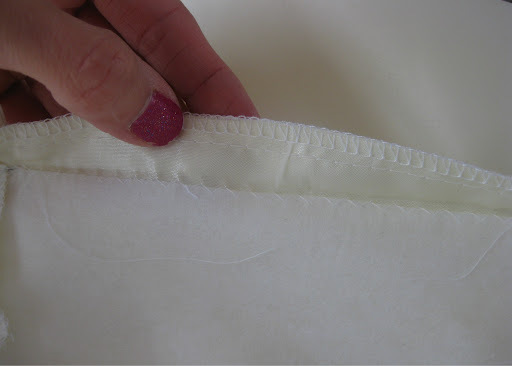 now for the neckline, i have seen in susan kajhle’s bridal couture book that you turn down the top edge and catch stitch it to the underlinings (instead of using facings) then slip stitch the top edge of the lining to the turned down shell fabric. i don’t have the final lining layer in yet, but i do have the catch stitched edge done. have you ever used this stitch? it is so lovely and feels quite sturdy. it also encases the edge of the fabric very nicely. here, finally, is my finished eclair! i wore this for easter and i am very pleased with how it turned out. the bodice fitting threw me for a loop initially. i had to muslin it about three times before getting a good fit! it’s all due to the position of the princess seams and how they narrow to the center at the waist. while i love this feature, i certainly scratched my head a bit as i tried to work the bodice down to my bust size. all in all, i got a fit that i am very happy with. i can stand, sit and breathe without being uncomfortable. always a good thing. 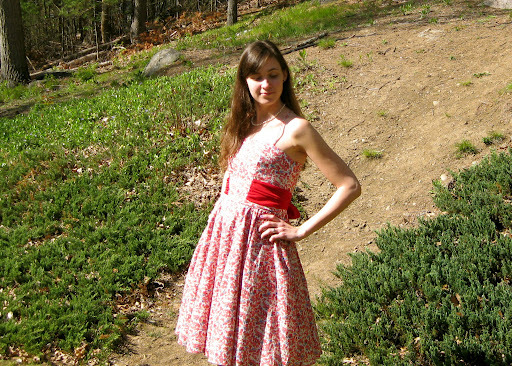 to achieve this, i had to lengthen the bodice by about 1 1/2″. part of this is due to me hiking the bodice up because i have a fairly high bust (and needed a church appropriate neckline). but also i’m on the tall side (5′ 8″) and needed the bodice to hit below the ribcage. you know, for breathing purposes. i also added 1″ to the length of the skirt, plus did a tiny rolled hem. and truth be told, it wouldn’t hurt to have added another inch in length. my shell fabric is a cotton lawn, bordering on voile, and the contrast ties are a poly chiffon. 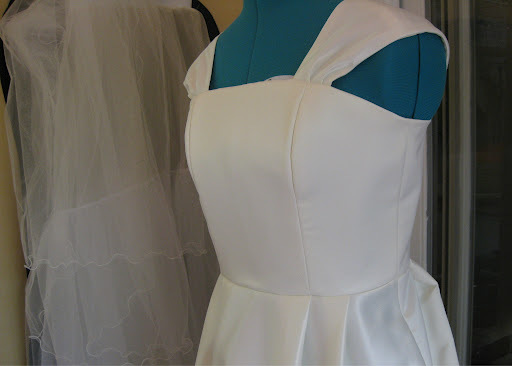 i underlined the bodice with muslin that i added fusible to. i didn’t want any fusible attached to the shell fabric and found this a really great compromise. i achieved the structure needed without the downsides of fusible possibly bubbling or causing weird creases or wrinkles on the bodice later down the road. picture that best showed off how the skirt hangs. 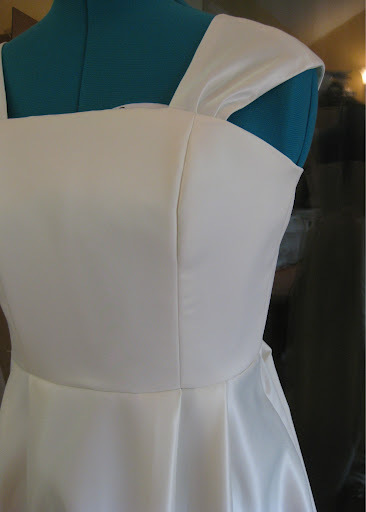 i fully lined the dress with a lightweight poly lining to which i added boning and a waist stay. it is amazing how much the waist stay does! it’s such a simple addition and really anchors the bodice in place without being uncomfortable. seriously, it only took about fifteen minutes to do this. and darn it all, i forgot to take pics as i put it in. next time! i also added some tiny spaghetti straps, crossed in the back. these don’t add anything structural, i just feel more comfortable with them there. also folks, this dress needs some hanging loops. if i hung it by the straps, they would stretch completely out of shape. and if you don’t add straps… well you’re probably gonna want to hang it up somehow! as a side note, i just wanted to say thanks to all the lovely comments on my daughter’s pajama pants. who knew all us fancy dressmaking gals would get so inspired by pj’s?